Easter is a terrific time of year to visit Florida. The weather is ideal for holidaymakers – mornings and evenings are cool and fresh, while noon temperatures often reach 27C/80F. The warm, sunny days are perfect for strolling around the attractions or idling the afternoon away on the beach. Families will appreciate the weather – the summer months can be too hot and humid for children. In the UK you’d expect to see a few daffodils at Easter to herald the arrival of spring. In the Epcot theme park at Walt Disney World, Orlando there are 30 million blooms at Easter! Epcot features an International Flower and Garden Festival every Easter. The gardens at the theme park look lovely throughout the year, but in spring they are at their best with additional plantings, topiaries and specially themed gardens. The stunning topiaries include many of your favourite Disney and Pixar characters, over a hundred being distributed throughout Future World and the World Showcase. Amazingly, they are all craned in over the course of a single frenetic night, having been meticulously constructed during the preceding months. Look out for the stars of Cars, Toy Story, Snow White and the Seven Dwarfs and Fantasia, to name but a few. A family of cute pandas and a traditional dragon reside at the China Gardens. Visit the French Fragrance Garden, where the scents of the flowers used to create famous perfumes fill the air. Children will be thrilled by Bambi’s Butterfly House, with its live butterflies and topiaries of Bambi and friends. Another favourite is the Pixie Hollow Fairy Garden, delicate fairy characters flitting amongst the flowers, and a play area for the little ones of your own. The Easter Egg Hunts in the park will also help keep them amused. Hone up your own gardening skills at the Festival Centre, with seminars and tips from expert gardeners. Complete a beautiful day by attending one of the live “Flower Power Concerts” which run nightly throughout Easter at the America Gardens Theatre. The famous artists, mostly from the Hippy years of the 60s, have previously included Herman & the Hermits, Micky Dolenz and Chubby Checkers. The kids will say “who?” but I remember them all! The Magic Kingdom theme park is the ultimate destination to provide memories of a lifetime for your children during the Easter holidays. The park, located at Walt Disney World near Orlando, is divided into 6 themed areas – Main Street USA, Adventureland, Frontierland, Liberty Square, Fantasyland and Tomorrowland. The main entrance leads into Main Street USA. It is themed on a small Midwestern American town in the early 1900s. The buildings, shops and transport are all from that era. Travel back to a quieter time and ride in an old-fashioned car, horse-drawn street car or fire-engine. Walt Disney himself used to drive around the park, before it opened in the morning, in the fire engine! He also loved trains, hence the narrow-gauge steam-trains that circumnavigate the park. Main Street is ideally suited for the daily parades of your favourite Disney characters. On Easter Sunday the “Dream Come True Parade” is preceded by a special Easter Parade. Mickey and Minnie Mouse are joined by Mr & Mrs Easter Bunny, who also provide “meet-and-greet” opportunities throughout the park. Pretty girls in their Easter bonnets parade amongst the colourful floats, while Easter songs play in the background. Look out for Chicken Little, Daisy Duck and the White Rabbit. At the end of Main Street is the Central Plaza, the hub of Magic Kingdom, affording access to the other “lands”. Beyond is the most iconic image of Disney World, the magical Cinderella Castle. Its many spires and turrets rise to 900 feet, and access is by a drawbridge over a moat. This fairy-tale fortress serves as an entrance to Fantasyland. If you want to win your daughter’s heart forever, dine at Cinderella’s Royal Table inside the castle and meet Cinderella beforehand. Turn her into a real princess with a makeover at Bibbidi Bobbidi’s Boutique. There are designated areas around the park for Character Greetings. The children can have their photos taken with their favourite characters and get an autograph. Meet Rapunzel from Tangled and Princess Tiana & Prince Naveen from the film The Princess and the Frog. Fantasyland brings to life the characters and places from Disney’s animated movies. The Enchanted Forest is based on the films The Little Mermaid and Beauty and the Beast. Popular rides are the giant tea cups of the Mad Tea Party and Dumbo the Flying Elephant in the new Storybook Circus area. The “It’s a Small World” boat ride travels past the different continents of the world, with 300 costumed audio-animatronic dolls leading a sing-a-long for each continent. Adventureland has a jungle theme. Enjoy a cruise on a tramp steamer through the jungle. Take a “dark” ride on the log-flume Pirates of the Caribbean attraction. Frontierland affords a trip back to the pioneering days of the Wild West. Board a rickety runaway train around Big Thunder Mountain to the gold-mining town of Tumbleweed. Cool off on a log-flume, water-fall descending ride through Splash Mountain. Pet the animals at Big Thunder Ranch. Liberty Square is the departure point for a full-sized paddle wheel steamboat. It is also the location of The Haunted Mansion, through which a not too scary ride can be taken on a “Doom Buggy”. As the name indicates, Tomorrowland is a vision of the future themed on an intergalactic city. Board the Space Mountain Ride, beginning in a strobe-lit tunnel and finishing with a journey into darkest space. Other popular attractions are the Astro Orbiter and the Finding Nemo Submarine rides. Join in the hilarious Monsters Inc.Laugh floor show and help generate electricity for Monstropolis with your laughter. Let your budding grand prix drivers accelerate to speeds of up to 7mph on the four-mile Speedway circuit. Naturally, Easter is a busy time and it is advisable to purchase a Fastpass to shorten the wait for the popular rides. A fitting culmination for your Easter celebrations is the spectacular “Wishes” fireworks display over Cinderella’s Castle, preceded by “The Magic, The Memories and You” projection show. Busch Gardens is a vast African-themed safari park and home to some of the most thrilling roller coasters in the world. It is located 8 miles north east of downtown Tampa, approximately one hour from Orlando using Interstate 4. However, if you use Interstate 275 instead, most of Tampa is avoided. Although Easter is busy, the park is not as crowded as the Orlando theme parks. At Easter, egg hunts with prizes are held 5 times a day, every child receiving a gift. The biggest challenge is to find the Golden Egg. There are organised games and photo opportunities with Easter Bunny. Craft sessions are held in which bunny masks are decorated. Now to the exciting part, the roller coasters. The latest ride at the park is the Cheetah Hunt. Sitting in a train-style car, you are launched out of the station into the surrounding grasslands, reaching 60mph in seconds. A second propulsion takes you at 4G to the top of a 130-foot high tower, from which you plunge into an underground trench. A 3rd burst at 60mph sees you back to the station, shaken and grateful. If that is not enough excitement, head for the Shreikra. The name is taken from an African hawk that dives vertically to catch prey. You’ll find out why the hard way! The ride begins with a 45-degree ascent of a 200 foot hill. It then leaves you perched on top of a sheer 90-foot drop for 4 seconds, with a clear view below as the coaster is floorless. They will seem like the longest 4 seconds of your life! When the brake is released the car plunges vertically at 70mph into an Immelmann loop. Before there is any chance of recovery, there is a 2nd vertical plunge, this time into a darkened tunnel, before finishing in a water splash. Phew! Do you still want more? Go to the Egypt section of the park and ride the Montu, named after an Egyptian god of war. It is rated as one of the top steel roller coasters in the world, with 7 loop the loops and G forces of 3.85. Next stop is the Kumba, meaning roar in Swahili. This visitor favourite features 2 interlocking corkscrew rolls, a zero G roll, a diving loop and a 114-foot vertical loop. Finish off on a traditional wooden coaster, the massive Gwazi. The name is taken from a mythical lion with a tiger’s head. It actually consists of 2 separate intertwining coasters, the Gwazi Tiger slaloms and Gwazi Lion spirals. Being wooden, it feels more unstable than the modern steel coasters, making the ride even more exciting. The coasters head towards each other at a combined speed of 100 mph, as they cross on 5 separate occasions, creating the illusion that they will crash head on! Young children are not forgotten, with scaled down but just as exciting coasters. Initiate them on Grover’s Alpine Express, just 24 feet high and 600 feet long, located inside Sesame Street Forest of Fun. Equally enjoyable is the Elephant Run bob-sled ride. Busch Gardens is home to nearly 3,000 animals. Free roaming African animals, including giraffes and many species of antelope, inhabit the Serengeti Plain, which can be viewed from the Serengeti Express Railway, the Skyride monorail or one of the scenic walkways. A popular family attraction is Jungala, with rope bridges to explore 3 storeys of jungle life. Be sure to follow the Tiger Trail leading to a glass viewing point in the middle of the tiger enclosure. Use Jungle Flyer’s zip line to travel through the treetops. Cool down at Wild Surge, a shot tower that launches you above a waterfall. 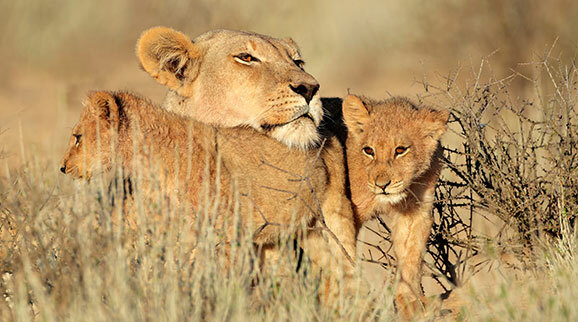 Take a foot safari through the Edge of Africa and encounter Nile crocodiles, lions, hippos, meerkats, a troop of lemurs and vultures. There is so much to do and see at Busch Gardens. You could easily spend your whole Easter break in the park! Discovery Cove is a tropical paradise of palm trees, lagoons and white sands, bathed in the hot sunshine that you can expect during your Easter holiday in Florida. 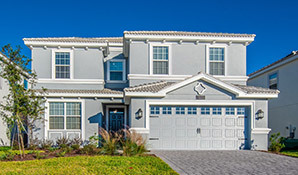 It is located in Greater Orlando, off Central Florida Parkway, opposite Seaworld. The great advantage of this attraction during the busy Easter period is that the visitor numbers are always restricted to 1000 a day, so Easter is no busier than any other time of the year. However, it’s advisable to book well in advance, particularly if you want to swim with the dolphins. The admission price includes everything from food and drink to the use of snorkel equipment and wetsuits. The food consists of a continental breakfast, lunch, unlimited snacks, including delicious ice-cream, soft drinks and beer. There is also free parking, lockers, towels, showers and changing facilities. The staff are extremely friendly and helpful. A terrific bonus is that the admission price gives free unlimited 14-day entry to either Seaworld or Busch Gardens. For many, the highlight of their holiday is swimming with the Bottlenose dolphins in Dolphin Lagoon. Pre-booked small groups are allowed to wade into the lagoon to swim, play, hug and feed these friendly animals. Each member of the group then has a moment of their own with a dolphin. A CD with pictures of this wonderful experience is offered as a memento. Look out for the photographers throughout the park and ask for photos to be taken to add to your CD. Explore the Grand Reef, whether just by paddling in the tranquil waters at the edge or diving down to swim among the hundreds of species of colourful tropical fish, rays and small sharks. Drift down the Wind Away River, surrounded by beautiful tropical vegetation. Floats and life-jackets are provided as required, otherwise swim or snorkel. The warm 8-foot deep waters have underground features, including a large stone totem pole and glassed off sections containing sharks. Be sure to visit the Explorer’s Aviary and feed the parrots and other tropical birds with the little pots of food provided. You may well end up with a parrot on your head or pecking on your bare feet! Relax on a sun lounger on the white sands of Serenity Bay, a large freshwater pool through which the Wind Away river passes via a cave and cascading waterfalls. North Beach is another lovely area to sunbathe whilst watching the dolphins play in the lagoon. There is no more pleasant and relaxing way to spend a day of your Easter holiday. We book all types of Easter Florida holiday. Let us know your requirements on an enquiry form for a quote. Even better, call us on 01934 319 851. All our Florida holidays are fully protected by both ATOL and ABTA. Looking for Easter Florida holidays from Manchester? Virgin and United Easter flights are in high demand so book early. This offer includes Orlando flights, two weeks in a luxury Champions Gate villa and fully-insured vehicle hire. Families will love Champions Gate – the huge pool, water slides, lazy river, splash park, restaurant, bar and movie theatre are just some of the facilities. The theme parks are just a short drive away. Book on deposit will full ATOL and ABTA protection. Planning your Easter Florida holiday from Scotland? Fly from Glasgow, Edinburgh or Aberdeen to Orlando or Tampa. Flights are popular during the busy Easter season, so contact us early to book your seats. 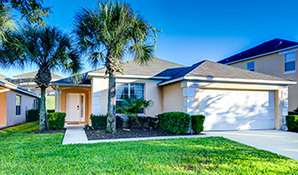 This Easter Florida holiday includes Orlando flights, fully-insured car hire and two weeks in a comfortable Emerald Island villa. Situated only 3 miles from Disney, Emerald Island is a beautiful resort surrounded by Florida conservation wet-lands. With excellent shopping and restaurants nearby, it’s perfect for a family Florida holiday. Book early!